While it might not always pop out as the most memorable year for anime, 2009 left a plethora of memorable series ranging from one-hit wonders to continuing powerhouses and the sprouts of legacies- Fullmetal Alchemist: Brotherhood, Bakemonogatari, Tokyo Magnitude 8.0, Spice and Wolf II, InuYasha, and Fairy Tail all come to mind in no particular order. Surprisingly, one of the most popular titles of the year would not (and still does not) have the kind of lasting score one would expect from the instantaneous recognition accompanying it over the last half decade. Tied for twenty-sixth with A Certain Scientific Railgun (another story for another time) on the 2009 scores for MyAnimeList at 7.87, K-On! deceptively lingers despite being the sweetheart of the Internet and fans worldwide. Where does the endearment come in for the Kyoto Animation smash hit exactly? From the same source’s Most Popular listing, the series sits at #56 overall. Surely there is more to the hype train than the Waifu Wars that have plagued forums since the series’ conception. Debatably one of the more artful entries into the Slice of Life genre, the hearty antics of a light music club came at a time when the well was running dry for the breed. The mid-2000's hammered so many good story elements that by the turn of the new decade, the margin of error was minuscule when pitching one of its kind. 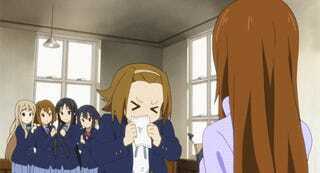 What K-On! brought was a much needed organic, mostly drama free series with rich humor and a blithe cast. Chances are you’ve heard of this one already, but the dub for this Sentai Filmworks licensed series, voice directed by Tony Oliver, is most certainly worth talking about. These are not reviews of a series or their dub, but rather opinion articles for the high notes from how the individual cast did, their overall chemistry, and/or the things that the dub brought to the series that benefited the source material. It is understood that dubs are not the most embraced means of viewing, so please refrain from commenting over the preference to the format as a thesis to an opinion. It is okay to not like dubs, but don’t ruin everyone else’s fun because you don’t agree. Articles will be tailored as spoiler-free as possible, with only vague notes on how an actor’s performance progresses as the story goes on, so feel free to read even if you haven’t seen the source material. Starting off the cast is the well decorated in accolades for anime voice acting powerhouse that is Stephanie Sheh. Chances are if you have watched a AAA dub or played a big JRPG that was dubbed, you have probably heard Sheh’s work. I had mentioned in a previous installment that I had issues pinpointing somewhere to start with introducing someone to some of her best work, as the long list of solid roles presented the intriguing question. After re-watching the dub for this series, I can confidently say look no further than the distracted guitarist Yui as a standout. From the beginning, the audience is given a raw musical prospect in a young woman without any particularly strong talent other than her ability to commit to what she sets out to (no matter how obscene said commitment might be). What begins as a shot in the dark at playing for a club soon becomes an obsession as she zig zags down the path of learning her craft and befriending new people. What makes Sheh’s role so memorable is less on the potential in a role like this, but moreso just how well she nails every one of the zigs and the zags. At face value, matching a character’s energy and movements seems routine, but to tastefully execute this while bringing a performance to someone who can slingshot from oblivious to focused and back to clumsily fumbling around is challenging. Think back to when a character had something to that effect as a trait in a dub and try to remember how the delivery felt. Chances are it felt rushed, chaotic, and jumbled, as if a straight line suddenly tangled up into a wild ball all over the place before resuming its normal straight line appearance. While it can very well be discounted as an unproven theory, I like to think this kind of part in a dub is one of the big examples that sticks out in the minds of people who might loathe dubbing. Roles pulled off like Sheh’s are the antithesis to this issue. Through all of the blunders and convictions as a character Yui goes through, there is a lot to be shown in how well Stephanie Sheh fares here. With so many different directions the character could have been portrayed, these lines are so much more powerful in defining exactly what it is that makes not only Yui’s character, but also the talent behind the voice. With all of the wild personalities roaming the light music club, there has to be somebody to put them in their place and try to keep some order around. While she wouldn’t win any awards for her discipline with the other club members, Mio Akiyama is basically the leader for the after-school band (after all, their teacher/club advisor is leagues below her in terms of responsibility). The go to choice for this would the normal stern, scolding voice that occasionally sounds generous similar to the need for a typecast jumbled voice that would usually accompany Yui. Instead, we are given the omnipresent (yet never overbearing) voice of Christina Vee to hold down the fort. Right from the jump, Vee shows just how much of a maestro she is with how impressively she controls the mood of a scene with a signature steady tone that fits the role like a glove. When Mio has moments of anger or fear, they aren’t so detached from what had been heard previously that it suspends whatever impression you might have had from the normal voice of the bassist. If nothing else, they are catalysts to a situation- practically cuing the rest of the cast to hop in on the silliness or pull it back in for a matter at hand. It would be easy to credit this to just how the character is written, but consider this: no matter how well engineered a plane is, without a pilot who can operate things well enough, all that aircraft would become is one bumpy ride through the skies with a sickening take-off/landing whenever it would have to journey. Without a performance like Vee’s, there is no way the atmosphere in the voices would be quite the same as Mio wouldn’t keep things where they would need to be (or worse, the voice wouldn’t fit what is trying to be accomplished and it would merely injure the pace of the overall product). As things move on throughout the club, Mio becomes more laid back and on board with the frolicking just enough not to forfeit her enforcing of the club’s (procrastinated) performances. Usually at this point in a character’s development, the voice changes to something completely different than what we were introduced to. Somehow, Vee manages to hold on to the reigns and convince the audience that even when going on a trip up to the mountains, there is a steady voice keeping the show together. The consistency is really admirable to say the least and deserves credit for the attention to detail in execution. It really can’t be overstated how important it is to have someone like this involved in a project- they’re the glue that holds things together and allows a lot more elbow room for creativity in scenes that might have before simply had the fun sucked out of them. Vee never sounds like she is nagging or dampening the spirit, letting the joy of her character shine through whenever she isn’t pulling everybody in. That is what real leadership is in a group, and Vee takes on that responsibility flawlessly. If Sheh brought versatility to the plate, and Vee brought control, then the last necessary big piece required is somebody who can bring a whole lot of fire and lead a fast break through a scene. Cassandra Lee Morris answers the call to bat with thunderous success, providing her talents for the boisterous president of the light music club in Ritsu Tainaka. Compared to the slingshotting required in the band’s newest guitarist and the collected composure needed for the bassist, drummer Ritsu rarely lets off the gas and is usually the first to tackle situations with the reckless agenda to be expected of an underworking band. As unflattering as that sounds, it really works well in the context of the series and is completely necessary for the hijinks. Much of the most memorable comedy here comes from at least a duo of the cast either discussing something or pranks between members, and it is really hard to imagine them getting done correctly without the right energy backing them. Yes, Sheh has a lot to bring in that department, but it takes two to tango, and Morris can provide a spark to the scenes that brings even the goofiest sides to the more serious natured members of the band. When it isn’t some really well delivered sarcasm, the audience can expect lots of jokes that can 180 the worst of situations (granted the club rarely is faced with much to be seriously concerned with) immediately. There is a lot more to the character than joking, as her passion for supporting the oasis her and her friends cherish stands out loudly (particularly in those times when the feeling of the room is that there aren’t any options left). In contrast, there were moments Ritsu would portray uncharacteristic spirits that left the others in the dark and impacted scenes far greater than to be expected from things as simple as minor illness or petty jealousy. Discount it as whatever, but in a show full of strong personalities put into a single clubroom, there is a lot to be said about how much heat you can feel in the fire here from Morris. Someone rallying others with how invested they are to a cause just feels organic, and furthers the overall impression left by the acting behind the character. Most of the interpersonal issues through the beginning chunk of the first season come from pretty underwhelming situations, borderline deterring certain bits of the audience from continuing the series. At just the right time, the character Azusa Nakano is introduced, flipping the usual menu of events in the series right on its side. Somebody else actually seeing the others goof off instead of performing spurs the natural reaction of disappointment and a call to arms completely foreign to the mood set previously. Cabanos hits the right buttons to achieve this drama while still managing to preserve just enough of the atmosphere for wiggle space in the staple comedy the series is known for. The issues obviously don’t last a long time, and in the end it relinquishes the responsibilities Mio has for maintaining the production from the club in some ways. This opens the floodgates for the rest of the show to become so absurdly laid back that it almost completely overshadows the tiny bit of drama beforehand. The impact Azusa has on the band adds another layer in that Cabanos turns in a pretty impressive performance in something so plentiful with those already. Several times, she carries not only scenes, but entire episodes (more than anyone else on the cast) due to how the plot might take the story without missing so much as a beat. It can be easy to overlook, but having almost entire episodes filled mostly with your own lines is no small feat, especially in a lively ensemble like this. Last but not least in the main cast, there is a role that really leaves more than what is given at first glance in the club’s keyboardist, Mugi. Make no mistake, the “X Factor” banner is there in the main cast for a reason- Lindley gives the audience something that is remarkably rare to see (or I should say hear, I suppose) in a dub. While this award could easily go from top to bottom to everyone who plays a character in the light music club, you really have to appreciate how much finesse is put into what is here. I’m a firm subscriber to the belief that the hardest things to pull off in voice acting have to be the ones that require the gentlest touch and have a crazy amount of difficulty to carry through chaotic scenes (exactly like the ones in K-On!). 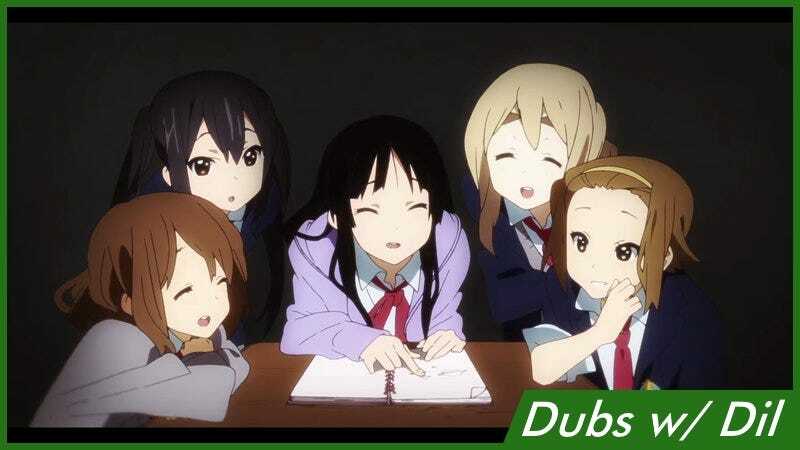 An absolute sleeper pick, Shelby Lindley really takes it outside the box with her creative approach in K-On! Soft-voiced characters are a dangerous bunch- sometimes they leave a lot to be desired in what we hear simply because a lot of them just end with the lines themselves. Despite being one of the few members of the band, someone like Mugi should fit the bill for a scenario like this to occur. Instead, through the tough hand dealt, Lindley works well with bringing a lively surge of identity from the role requiring a challenging pianissimo delivery. Many times, there are instances where Mugi has the strongest opinion or is the funniest character of a scene without ever breaking the role’s boundaries. Even when she wants to try not being polite and play the fool of the group, Lindley finds a way to make rude lines sound hilarious when they really shouldn’t be as funny as they would be otherwise. Something like that can’t be replicated easily, and it is a mark for adept acting. Here is hoping she can land some big roles in the near future- she absolutely deserves them! Xanthe Huynh (Yuuki Yuuna in Yuuki Yuuna is a Hero) provides a pretty solid role as Yui’s younger sister Ui Hirasawa. She is often playing alongside Cabanos, covering the rest of the ground in those few episodes where she is carrying most of the workload (which, much like Cabanos, speaks a lot to her abilities to do such a thing). Karen Strassman (Kallen Stadtfeld in Code Geass: Lelouch of the Rebellion) is one of the most colorful out of anyone involved in the dub as Sawako Yamanaka- something you’d expect the least from someone who is supposed to be the “experienced mentor” role. Rocking harder than the club, meltdowns over dates, and showing up to group trips hungover all provide humor that fits in well with the rest of the insanity. Laura Bailey (Rise Kujikawa in Persona 4 the Animation) makes for a student council president well in Yui’s long-time childhood friend Nodoka Manabe. Her role grows (much like the rest of the support cast) as the show matures, letting Bailey flex her acting chops in a few subtle spots for a nice supplement. Michelle Ann Dunphy (Margaret in Persona 4 the Animation [sorry for the same show twice in a row!]) gives a much overlooked comedic role as Jun Suzuki and has me curious as to why there isn’t more work for her- this and her work in Atlus games are good! The spirit you expect is front and center from start to finish in the dub for the smash hit. Where everyone here individually excels at their roles and leaves little to no room for debate as to their status as voice talents, the best part of it all is how well it comes together without a doubt. How can there be a show about a band and the group not sounding good as a whole? There are plenty of moments to be had in everyone pairing up for scenes and bringing the best out of things together for laughs and really natural sounding conversation. I have it on good experience that most I’ve spoken to who know a lot of these voice actresses is because of this very dub. Like a great business established from the right people working with the right qualified positions filled, there was a little extra something here from top to bottom that made the chemistry stronger than iron. Turning a J-Rock phenom like this into a dynamic slice of life/comedy showcase couldn’t have had a better result for the K-On! series. Popular or not, the ball could have been dropped if the right moves weren’t made here, and K-On! absolutely does not disappoint. Being set up the way it is, any particular episode will show a little bit of everything the cast has in their arsenal, while still leaving you thoroughly impressed every single time you watch what you might think you saw coming from them. It really is impressive to take a second and appreciate the little things contributed to the overall product and only gets better with further analysis. One of my all-time favorite “leave on in the background while working on something” shows, this one is a must watch for the investments given by the budding cast of vocal talents. Got a dub you wanna see on Dubs w/ Dil? Throw me a line and I’ll look into it. Have yourself an awesome day!